Photos of the trip here. Twelve trucks lined up outside the Royal Hotel in Naseby at 9.00am and soon we were off up the Mount Buster road headed to what was the highest altitude gold mine in the country. 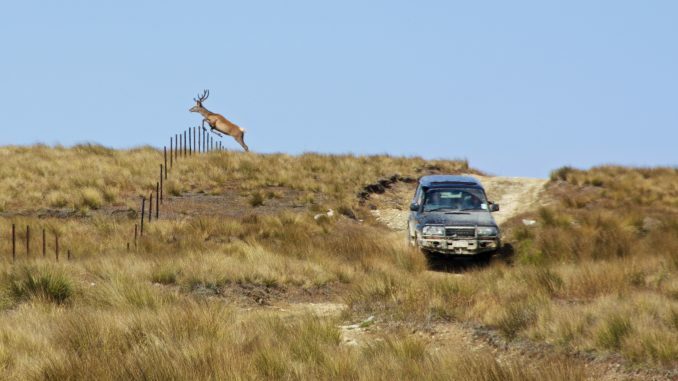 After exploring the limestone slopes and crags of the old diggings we headed for Hut Creek and on the way spooked a local resident, a nice 10 point stag which hurdled a fence in it’s hurry to get away. After lunch at the stone Hut Creek Hut some of the party decided to separate and forego the trip up Hut creek onto the slopes of Mt Kohurau, overlooking the Waitaki valley, because they were concerned about the big distances involved and how long it would take us to get back to Naseby. For those with young children especially it was a wise decision. The biggest hurdle with this huge park is the distances involved and there are no short cuts. The iPad GPS recorded the distance from Naseby to Home Hills Runs road via Mt Kohurau at 93kms and at 4wd speeds that takes a lot of time. The iPad recorded 10 hours. 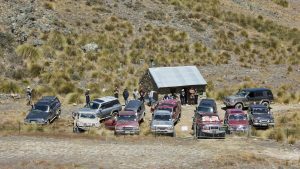 To do the entire trip leaving Naseby at 9.00am is too late—a sharp 8.00am departure is required, especially with a big turnout and where there are young children in the group. So five trucks headed up Hut Creek while the other seven headed toward Home Hills Run road—and got bushed shortly after the track junction, missing the turn down into the creek where the stock bridge crosses. So after some long range radio calls to the Hut Creek party seeking directions, they wisely decided to back track to Naseby via Mt Buster and arrived nice and early at 6.00pm. Even the remaining party of five got lost after the track junction and it was only Glenys looking at the iPad GPS location sounding the alarm that got us back on track toward the stock bridge creek crossing. The trip over the wide open tussock slopes passing Ida Valley Station DOC hut was special with huge big sky views of Aoraki and the Remarkables. We finally arrived back in Naseby at 8.30pm just in time for a welcome beer and dinner at the pub. Pam pulled into the pub park with a near flat rear tyre—lucky it was not on the tops—we were late as it was.